The sport is similarly famous among children as well as youngsters. It is the only game that has a record of the highest number of audience in a single match. Here is our pick of the top 10 handsome soccer players 2019. Football is an enormously popular sport which has produced many remarkable and energetic players. Football has got the most attractive personalities which are reasons why the game attracts the most spectators towards it. Our countdown of top 10 Handsome Soccer Players 2019 arises with Real Madrid and Belgian goalkeeper Thibaut Courtois. On the 13th of May 2014, Thibaut Courtois was called for FIFA World Cup 2014 which was held in Brazil. He played all games through the opposition but accepted extra time goal in the quarter-final against runners-up Argentina. Courtois then displayed a great performance at the 2018 FIFA World Cup in Russia. He displayed a great performance in the UEFA Euro 2016. Besides football, Courtois always remained in the limelight due to his romantic affairs. His girlfriend Marta Domínguez gave birth to their daughter Adriana in 2015 but she separated from Courtois in 2017. Interestingly, Marta was pregnant with their son Nicolás at the time of their separation. At #9 in the List of Handsome Soccer Players is Spanish attacking midfielder Isco earned his fame among girls for his attractiveness and elegance of play. In the year of 2012, he was presented with the Golden Boy award. With this success, Real Madrid took attention on him and signed him for 30 million Euros in 2013. Being a midfielder for Malaga, Isco recorded 14 goals after playing 69 games. He came into prominence after scoring his debut international goal against Belarus in a UEFA Euro 2016 qualifying match. And, the media went crazy when he scored a brilliant hat-trick against Argentina in March 2018. Recently, displayed quite a decent performance for the final Spanish squad for the 2018 FIFA World Cup in Russia. The Chelsea midfielder Cesc Fabregas is on the 8th spot in top 10 handsome soccer players 2019. Cesc Fabregas is married to Daniella Semaan and the couple has a pretty daughter named Lia. This football talent has played more than 400 games for his clubs. He has scored more than 60 goals en route. A product of La Masia academy, Fabregas made his Spanish national debut in March 2006. And since then, he proved himself as one of the key players of the side. Besides, he also represented his nation in three World Cups and three UEFA Euro Cups. As an interesting fact, Fabregas made the assist of Andrés Iniesta’s winning goal in the 2010 FIFA World Cup final. With a stunning look and brilliant hairstyle, Spanish defender Gerard Pique definitely deserves his place in the most handsome soccer players‘ list. Another product of Barcelona’s La Masia, he became an integral part of the Spanish team since his debut in 2009. Besides football, he also created media sensation through his verbal and twitter feud with Sergio Ramos. Pique started dating the Columbian hotness Shakira since they first appeared together in the ‘Waka Waka’ video. The couple now has two children together, Milan and Sasha. Besides, Pique also made his name in the fashion industry while being the face of ‘HE’, the exclusive men’s line of Mango. Former Atletico Madrid forward David Villa is on the 6th spot in the list of top 10 handsome soccer players 2019. The all stage top goal scorer of Spanish football is married to his youthful girlfriend Patricia Gonzalez. He was handed the number 7 jersey and scored the first-ever goal for NYCFC in a sociable match. Villa married his childhood sweetheart Patricia González way back in 2003. The couple now has three children, Zaida, Olaya, and Luca. Interestingly, he engraved the names of their kids on his personalized Adidas F50 boots. Besides football, Villa also sang with Grammy-nominated Spanish singer Ana Torroja in 2010. 26-year old German attacking midfielder Mario Götze possesses unique dribbling and speed. Widely dubbed as one of the best German talents, he played for Borussia Dortmund from 2009 to 2013. Then, he took the transfer to Bayern Munich. However, he came back to Dortmund after three seasons. Besides his club appearances, Gotze also made more than 60 international appearances for Germany and marked his prominence in the squad. Mario Gotze started dating German lingerie model Ann-Kathrin Brömmel in July 2012. Tragically, he was diagnosed with a metabolic disorder called myopathy in March 2017. Besides football, this German star has appeared in numerous ad campaigns and also featured in the front cover of Pro Evolution Soccer 2015. The highest goal scorer of FIFA World cup 2014, James Rodriguez, is the fourth most handsome soccer players in 2019. Rodriguez got world’s attraction during the 2014 Brazil world cup when he scored important goals and a stunning one against Uruguay for which he was awarded the best goal of the year 2014. Besides international football, James also made his name in the club circuit. After a brief session with Porto, he took his transfer to Real Madrid in 2014. But, he eventually became the costliest benchwarmer in the club and has appeared in just 77 matches in four seasons. Then, he moved to Bundesliga side Bayern Munich on loan in 2017. He is one of the superlative football players who registered their names in winning gigantic trophies is in third place of Handsome Soccer Players in 2019. Kaka marked his name in the history of football for being the only third player to win the FIFA World Cup, the UEFA Champions League and the Ballon d’Or. He married his long-time girlfriend Caroline Celico in 2005, and the couple now has two kids together, Luca Celico Leite and Isabella. But tragically, they announced their Divorce via social media in 2015. As an interesting fact, Kaka first achieved ten million followers on Twitter and marked his name as the most popular footballer of his time. 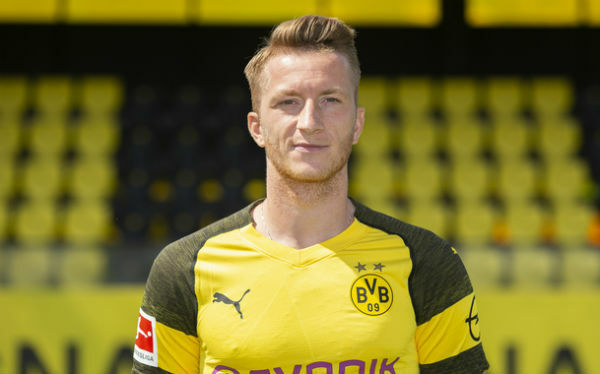 German forward Marco Reus is one of the Handsome Soccer Players in 2019. His style of play and looks make every football fans to have a deep emotion for him. He was penalized over 500,000 pounds for driving without a license having been issued with fast-moving tickets on at least five times since 2011 without the authorities knowing that he was not permitted. Marco Reus started dating Carolin Bohs in 2009, but tragically, they separated in 2013. However, they still remained close friends according to recent reports. He then started dating German model Scarlett Gartmann in 2015. Besides football, he also featured as the cover star of EA Sports FIFA 17. Here is the most Handsome Soccer Player in 2019. The Juventus and Portuguese winger, Cristiano Ronaldo, is the most fashionable football player. The five-times FIFA Ballon d’Or winner is at this position since 2013 after the retirement of David Beckham. Widely regarded as one of the greatest footballers of all time, Cristiano Ronaldo not only made his name with his skills but also with his dashing looks. The media went crazy when he announced his separation with Russian model Irina Shayk in 2015. He then started dating Georgina Rodriguez. Besides football, he also steadily held his spot as the highest paid and richest football players since 2013. That’s all about the list of top 10 Handsome Soccer Players 2019. The presentation of the performer, improved by their gameplay, swiftness, focus, and powerfulness, is what creates remarkable moments on the ground. So, how was the Handsome Soccer Players 2019 list?